Search engines look at how you distribute keywords throughout the pages on your Web site. There is some debate over whether placing keywords higher on the page gives a boost to your rankings. In general, it’s better to sprinkle the keywords evenly through the page in a normal writing fashion. Natural-sounding text is easier to read, and scores better with search engines. You can visualize keyword distribution if you imagine all the content of a Web page arranged horizontally in a box, so that the beginning of the page is at the far left and the last words on the page are at the right edge. 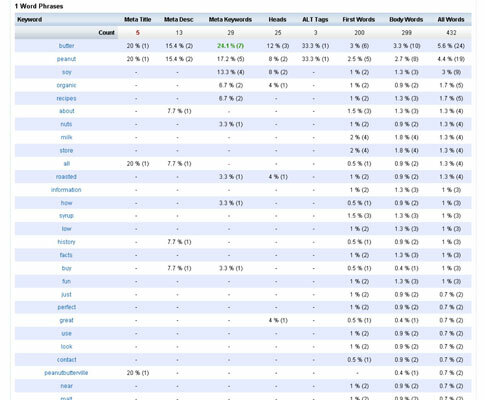 The above figure shows the distribution of a keyword on a given page. The chart shows that the keyword phrase peanut butter occurs once near the beginning of the page, a couple of times near the middle of the page, and not at all near the end. Although a more even distribution would be better, search engines could tell from this distribution that the word peanut butter is an important keyword for this Web page. In order to have proper keyword distribution, you can’t clutter up your page with keywords or just dump them on the page. When writing your text, form sentences that use those keywords. Search engine users are getting more sophisticated these days and entering search queries that contain three to four words instead of just two or three. If you’re a good writer, you’re going to have to tame some of those habits you learned while writing papers. Good writers are encouraged to use synonyms and rephrase things to keep from being too repetitive. This makes a document easier to read, surely, but it won’t help with your site rankings. Because your search engine ranking is going to be measured using a math equation, it’s better to think of your site in terms of supplying the equation with numbers. For instance, if you want to rank high for a query like classic cars, you’re going to have to keep using the words classic cars in your page instead of using these and them and so forth. Use discretion when doing this; otherwise, your page could become unpleasant to read. For example, if you were using a particular word, you would want to distribute it evenly through the text. But too much repetition sounds unnatural. Instead, you could mention keywords every now and then, when it’s appropriate. On the other hand, you wouldn’t just say keyword once and then spend the rest of your time trying to find flowery ways to refer to keywords. Your competition is a good way to get an idea of what looks natural to search engines. On the flip side, there is such a thing as using too many keywords — that’s how you venture into the realm of spam through keyword stuffing. There’s no guaranteed magic number for keyword frequency or density, but it’s a good rule of thumb to keep your keyword below five percent of the total number of words on the page. The better way to do it is to make it sound natural as compared to your competition. This Web page needlessly repeats the keyword peanut butter. Not only is this bad writing, but it could also be considered keyword stuffing. Use a keyword too often, and you could trip an alarm on a keyword stuffing filter. Keywords repeated too often also work against user retention and could bring down the conversion rate. For a commercial Web site, you want to keep customers around so they’ll make purchases, and you risk driving them away with too much repetition. For an informational or reference Web site, the goal is to have as many visitors as possible stick around and read the information available. Badly written text does not make someone want to stay on your Web site. 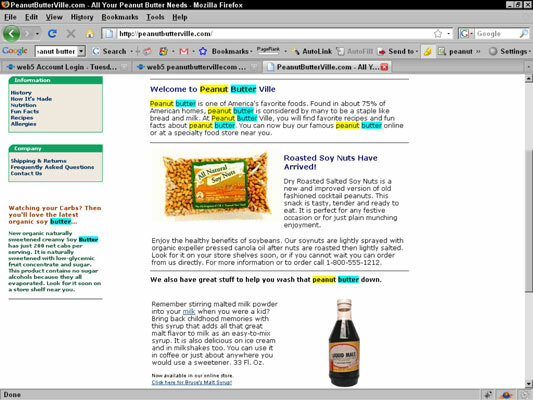 The above figure shows a made-up example of a Web page with keyword stuffing.